We have mentioned a little about the new Interstitial Plate from BT Wholesale already, but the difference it can have for some people means it deserves another mention. The imbalance and noise pick-up due to the ring wire used in phone wiring in the home in the UK has been known about for some time. 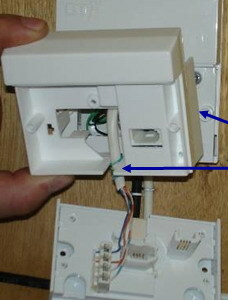 In the past the solutions have been to fit an ADSL faceplate to the master socket, or manually remove the ring wire. BT Wholesale has produced a device dubbed the iPlate that sits between the customer removable part of a BT master socket and the BT maintained part. The demonstration of the device and its effectiveness was based around a fluorescent light stripe that visually functioned perfectly, but had a power supply that generated a lot of noise in the frequency ranges that affect ADSL and/or ADSL2+ signals. The demo saw the interference drop a line connecting at 3.8Mbps down to 0.7Mbps and the new faceplate bringing the line back around 2.5Mbps. The demo was a reproduction of a problem unit seen in a customers premises, and for the ease of reproduction the noise was reproduced using electronics. 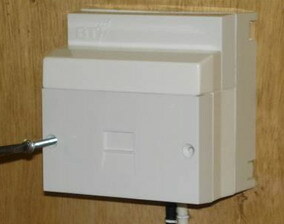 Some people may see no speed increase using this device so it is not a fix for every broadband problem that exists, but can improve connection speeds or reduce the number of random reconnections for enough people that BT Wholesale has bothered to get to the point where it is tooling up to make the iPlate available in quantities. For some people on long lines who just tried ADSL micro-filters and got no workable signal and never had a BT engineer visit the iPlate may mean they can sustain a workable connection. It must be pointed out that the iPlate does not remove the need for ADSL micro-filters, so those happy to wire in a full ADSL faceplate may prefer to do so. The advantage is that the new iPlate is easier to fit and does not require people to punch down wires into connectors at all. Cost wise BT Wholesale is suggesting a wholesale cost under £5, so what the retail price will be depends on the broadband providers. Some may decide to simply ship the iPlate for free with connection kits, others may well add handling fees and postage, which could easily see it rising to the £10 mark to buy. It is expected that once the new ADSL2+ products from BT Wholesale appear that the iPlate will follow, so given the current timetable this will be around April/May 2008. The iPlate does seem quite a good idea on the surface of it but it has the potential to cause wiring problems as the user pulls forward the plate to insert the iPlate. Seeing as how the wires are connected to IDC terminals on the faceplate it is quite easy to accidently dislodge the wires, especially as sometimes it takes quite some effort to pull the faceplate out. What happens then is the worried customer complains that it is this device the ISP sent them that caused them to break their phone wiring. Yes, but this doesn't help us that have the old type socket, or will it. Given that even the phone book suggests removing the faceplate when checking for a phone fault, one hopes incidents of over enthusiatic faceplate pulling are pretty rare. A lot will be down to providers and the install notes they supply. What's in it? I have connected a filter into the master socket and the router into that filter. All the phones wire into the filter, which means I don't need any more filters. If you have an ADSL faceplate then the iPlate will make no difference. Looking at the pictures as far as i can see (Though may be wrong would like to see the thing up close) it looks nothing more than an over elaborate filter to me, with a pass-thru for your modem to plug into the master/test socket. 1 Cant believe they may flog this for 10 quid... I spose when people yank the facplate off and screw things it will be a nice call out charge to fix it. 3 iplate = Tell apple see they can sue their backside. of course it's only a filter to take out ring wire interference. It is intended for those too timid to replace the faceplate themselves, or to modify their wiring. "Dont for a second think it will help very slow lines" - I hope nobody is dim enough to take any notice of this drivel, the longest lines are those most prone to local interference as the signal is at its weakest. ""Dont for a second think it will help very slow lines" - I hope nobody is dim enough to take any notice of this drivel, the longest lines are those most prone to local interference as the signal is at its weakest." Maybe so, but low speeds on long lines aren't always caused by local interference. Only an iDiot would expect an iPlate to work miracles in those circumstances. Why is every new product coming out with an i? When marketing people catch "web 2.0", they begin uncontrollably putting "i" at the start of product names. quote"Maybe so, but low speeds on long lines aren't always caused by local interference. Only an iDiot would expect an iPlate to work miracles in those circumstances." Everyone should know by now when it comes to anything BT related herdwick will be right there like a plague to back up the stupid claims. I didnt even use the term long line i said "Dont for a second think it will help very slow lines" there is a difference, if ya line is slow its slow, this wont work any miracles unless you have weird interference on your line. It's for all those people who need a ring wire on extensions or don't want to remove it (for whatever reason). Most lines where I have removed the ring wire from extensions have improved, no matter the length. And more SNR and better stability on many lines results in higher sync speeds and better ADSL profile. will retailers be able to sell this or is it only ipstream isps only able to distribute them? As far as I am aware this is being trialled at the moment and no commercial decisions have been made that I'm aware of. Its still early days but from what I've seen it will be of benefit to those not so handy or wary of tinkering behind the NTE. I guess removing the ring wire will still be more effective as no filter can be 100%. Am I right in that assumption? Removing the ringwire and filtering do two completely different things. All filtering does is to remove the ADSL signals from the telephone socket on the filter. Similarly it will also prevent phone equipment from transmitting back onto the ADSL frequency range. But if no phones are plugged in, a filter is useless. Removing the ring wire helps to stop your phone extensions acting as a large aerial! Just to clarify "if no phones are plugged in, a filter is useless"
It might be worth clarifying, that if you have a new 'Openreach' branded NTE, then this will already have an integral bell wire choke/filter, and as far as I can tell, thats all the I-plate is doing also. There have also only been 50 of these made for the trial, at quite some cost, but as previously mentioned, this is not the be all and end all of sync, speed or interference issues. It certainly does! I've seen removing a ring wire make a "no-go" line deliver a reliable 1Mbps connection. The iPlate is the equivalent of removing the ring wire, so it would have achieved the same thing. Having read your article on removing the third wire. I am still unclear as to whether you are referring to the wire coming into the master socket from the BT pole outside my property, OR, do I remove only the wire leading from the master socket to the other socket and then all other sockets in the house? Not being overly technical this question is posed. My master socket is about 35 feet away from my Broadband socket, BUT I also have a phone line that runs from the same broadband line in a socket next to the broadband socket, so if I was to install this iPlate on the master socket would that disable the phone that is next to and runs off of my broadband line, or is the ringer line old/unused these days and not required to ring modern phones? I'm fascinated by all this. BT state that an Openreach NE5 Socket CANNOT use the I Plate; but, when I called BT because my internet connection speed and reliability were appalling, it was Openreach they sent round and guess what, they put in a new NON-Compatible Openreach NE5 socket. No improvement at first, then, a week later, with nothing else done all suddenly started working better!! Dare I speculate that was how long it took for the technician's report to run through the system and for BT to discover a fault nearer the exchange?